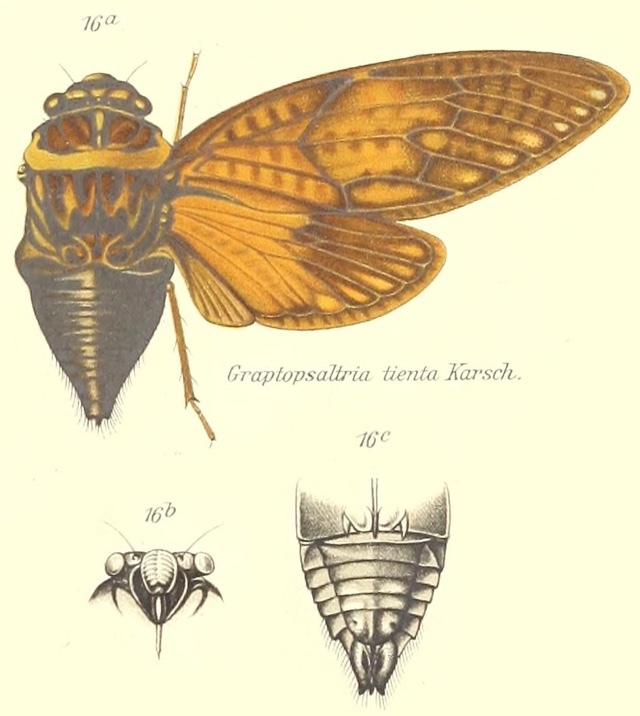 Angamiana aetherea Distant, 1890 is a cicada found in India. 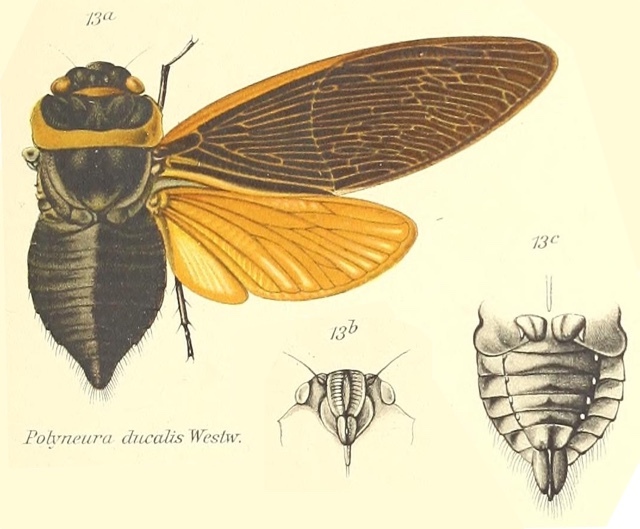 Body black; eyes castaneous; anterior, lateral, and posterior margins of pronotum (the first narrowly), and an abbreviated, central, narrow, longitudinal fascia to same, posterior margin of metanotum, head beneath (excluding face), sternum and opercula pale greenish-ochraceous; legs and rostrum black. Body more or less clothed with greyish pile, especially at the lateral margins of the mesonotum and the base and segmental margins of the abdomen. Tegmina semihyaline and of a pale shining bronzy hue, the venation darker and either ochraceous or greenish, the costal membrane pale greenish; the extreme base and the veins enclosing the postcostal area black; the veins enclosing the two uppermost apical areas, the terminal vein of the lower ulnar area, and the outer margin dark bronzy. 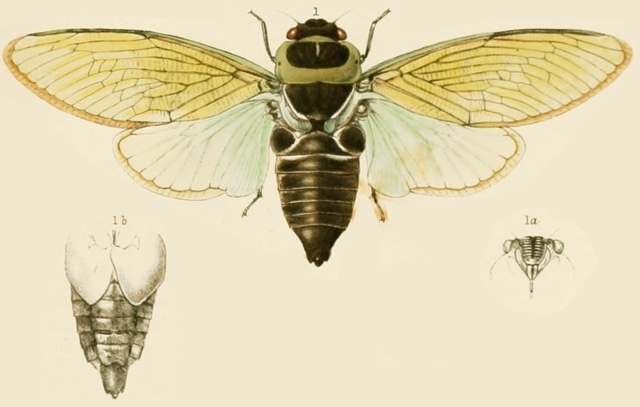 Wings pale bluish-green, becoming pale bronzy towards apex, the outer margin dark bronzy. The opercula are broad and divergent, their outer margins convex, their inner margins oblique, their apices obtusely angulated and not reaching the middle of the abdomen. 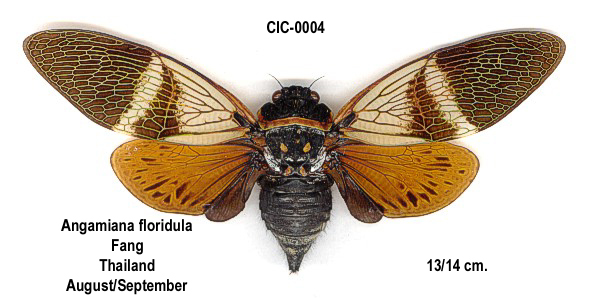 The rostrum about reaches the posterior coxae. Angamiana floridula Distant, 1904, is found in the southeastern quadrant of Asia, including China, India, Vietnam, and Thailand. Characters. — Head small, including eyes much narrower than pronotum and narrower than base of mesonotum, ocelli much wider apart from eyes than from each other, front much depressed; pronotum longer than mesonotum, its lateral and posterior margins very broad, the first strongly ampliated and obscurely angulated; abdomen longer than space between apex of head and base of cruciform elevation, above with its lateral areas oblique; tympanal orifices completely covered ; opercula broad, obtusely angulated, not reaching the middle of abdomen; tegmina semihyaline, with the apical third more or less reticulateh^ veined, the apical areas numerous, generali}’ twelve or thirteen in number. 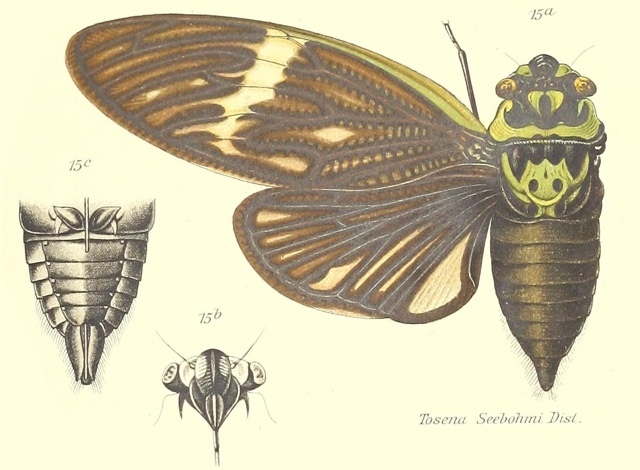 Formotosena seebohmi (Distant, 1904) was formerly Tosena seebohmi. 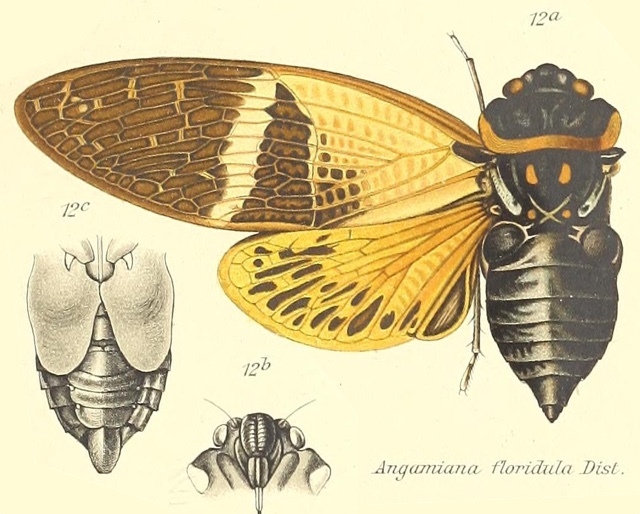 Its genus changed from Tosena Amyot & Audinet-Serville, 1843 to Formotosena Kato, 1925. Yes, its name name has changed since 1913! 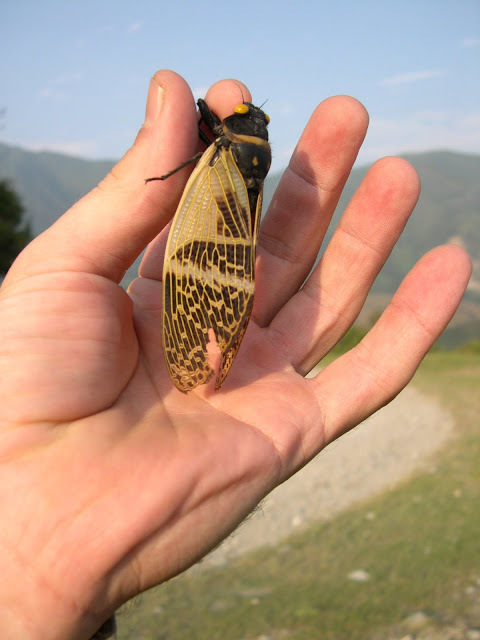 It is found in the Republic of China (Taiwan). 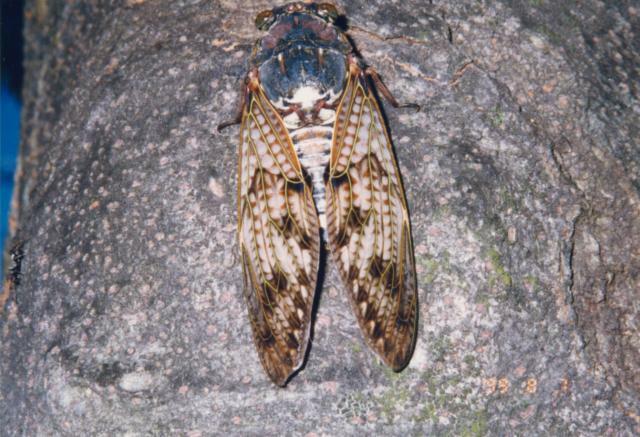 The image might say Tosena seebohmi, but the newest name for this cicada is Formotosena seebohmi.